A problem I assigned my precalculus class this past Thursday ended up with multiple solutions by the time we finished. Huzzah for student creativity! Find equations for all polynomial functions, , of degree for which and . After they had worked on this (along with several variations on the theme), four very different ways of thinking about this problem emerged. All were valid and even led to a lesson I hadn’t planned–proving that, even though they looked different algebraically, all were equivalent. I present their approaches (and a few extras) in the order they were offered in our post-solving debriefing. Solution 1–Regression: Because only 3 points were given, a quadratic regression would derive a perfectly fitting quadratic equation. Using their TI-Nspire CASs, they started by entering the 3 ordered pairs in a Lists&Spreadsheets window. Most then went to a Calculator window to compute a quadratic regression. Below, I show the same approach using a Data&Statistics window instead so I could see simultaneously the curve fit and the given points. The decimals were easy enough to interpret, so even though they were presented in decimal form, these students reported . For a couple seconds after this was presented, I honestly felt a little cheated. I was hoping they would tap the geometric or algebraic properties of quadratics to get their equations. But I then I remembered that I clearly hadn’t make that part of my instructions. After my initial knee-jerk reaction, I realized this group of students had actually done exactly what I explicitly have been encouraging them to do: think freely and take advantage of every tool they have to find solutions. Nothing in the problem statement suggested technology or regressions, so while I had intended a more geometric approach, I realized I actually owed these students some kudos for a very creative, insightful, and technology-based solution. This and Solution 2 were the most frequently chosen approaches. 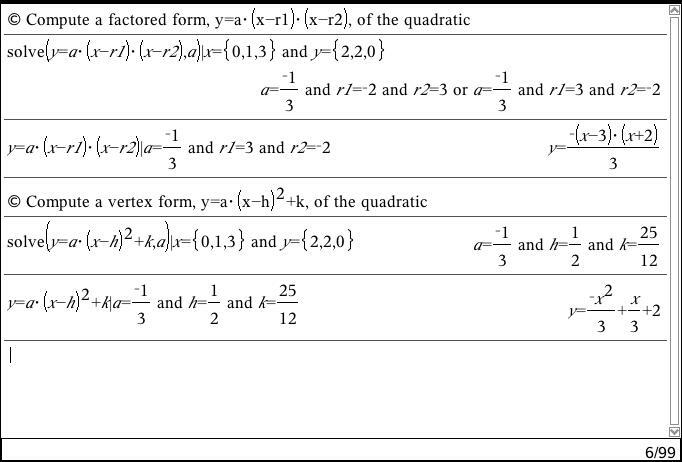 Solution 2–Systems: Equations of quadratic functions are typically presented in standard, factored, or vertex form. Since neither two zeros nor the vertex were explicitly given, the largest portion of the students used the standard form, to create a 3×3 system of equations. Some solved this by hand, but most invoked a CAS solution. Notice the elegance of the solve command they used, working from the generic polynomial equation that kept them from having to write all three equations, keeping their focus on the form of the equation they sought. This created the same result as Solution 1, . CAS Aside: No students offered these next two solutions, but I believe when using a CAS, it is important for users to remember that the machine typically does not care what output form you want. The standard form is the only “algebraically simple” approach when setting up a solution by hand, but the availability of technology makes solving for any form equally accessible. The next screen shows that the vertex and factored forms are just as easily derived as the standard form my students found in Solution 2. 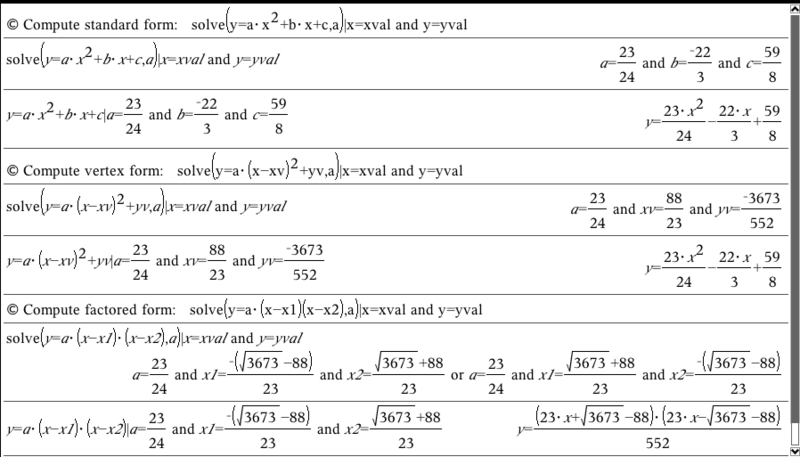 I was surprised when the last line’s output wasn’t in vertex form, , but the coefficients in its expanded form clearly show the equivalence between this form and the standard forms derived in Solutions 1 and 2–a valuable connection. 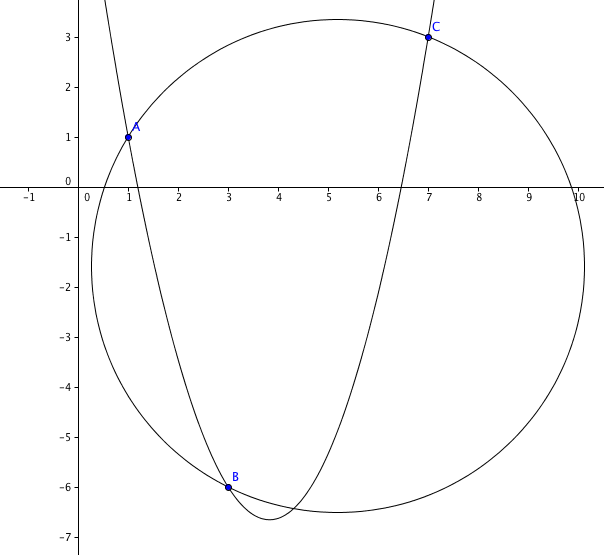 Solution 3–Symmetry: Two students said they noticed that guaranteed the vertex of the parabola occurred at . Because defined one real root of the unknown quadratic, the parabola’s symmetry guaranteed another at , giving potential equation . They substituted the given (0,2) to solve for a, giving final equation as confirmed by the CAS approach above. If you don’t like how a question is posed. Change it! Just remember to adjust the answer. Notice that two of the given points have the same y-coordinate. If that y-coordinate had been 0 (instead of its given value, 2), a factored form would be simple. Well, why not force them to be x-intercepts by translating all of the given points down 2 units? The transformed data show x-intercepts at 0 and 1 with another ordered pair at . From here, the factored form is easy: . Substituting gives and the final equation is . Of course, this is an equation for the transformed points. Sliding the result back up two units, , gives an equation for the given points. Aside from its lead coefficient, this last equation looked very different from the other forms, but some quick expansion proved its equivalence. Conclusion: It would have been nice if someone had used the symmetry noted in Solution 3 to attempt a vertex-form answer via systems. Given the vertex at with an unknown y-coordinate, a potential equation is . 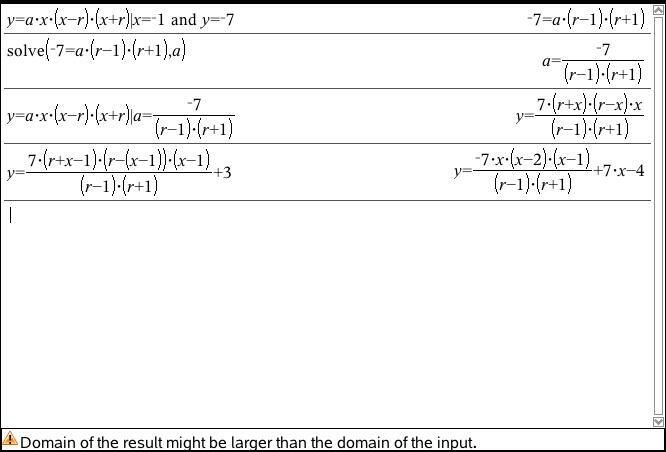 Substituting and either creates a 2×2 system of linear equations, . From there, a by-hand or CAS solution would have been equally acceptable to me. That the few alternative approaches I offered above weren’t used didn’t matter in the end. My students were creative, followed their own instincts to find solutions that aligned with their thinking, and clearly appreciated the alternative ways their classmates used to find answers. Creativity and individual expression reigned, while everyone broadened their understanding that there’s not just one way to do math. I’ve learned so much math and strategy by listening carefully to students who haven’t yet “learned” that some things are impossible. If you’ve read many of my posts, you know I’m a major proponent of the power of CAS for teaching and learning. Following is an unexpected solution to a problem I asked on a quiz. It is also one example of why I believe we should be giving our math and science students access to CAS technology. I’m teaching (for the first time) a senior Calculus-Statistics class at my school this year. It’s been over a decade since I’ve taught a stats course, so I was pretty excited with this assignment. This is the second year of the course, all of the students have TI-Nspire CAS calculators, and my high school is in its rollout year of a 1:1 Macbook program. Because of the laptops, all students now have Nspire CAS software. Using the Nspires, it is possible to avoid all use of normal distribution tables. For the first time in my career as a student and teacher of statistics, I haven’t spent a single moment on the statistical tables in the back of the book, and I think my students are actually stronger and understand better for it. Basically, there are two calculator/computer commands we are using for working with normal distributions: normCdf(a,b,m,s) and invNorm(c,m,s). 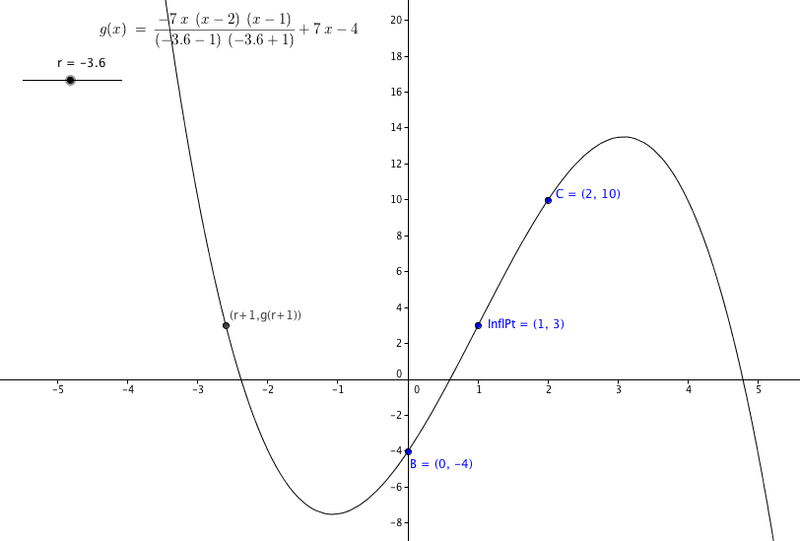 For normCdf, a and b are the respective upper and lower bounds of the normal curve with mean m and standard deviation s. The function returns the percentage of the normal area between a and b. 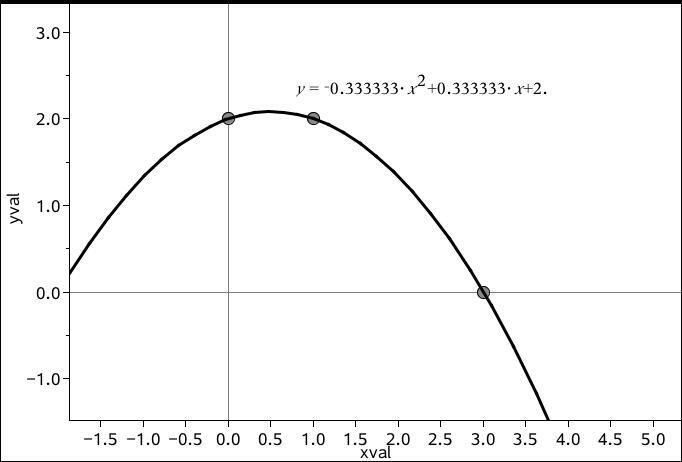 For invNorm, c is the area of the left-tailed region bounded by and b under a normal distribution curve with mean m and standard deviation s. The function returns the value of b. This software is so much faster, more powerful, and more flexible than the tabular computations that comprised all of my prior teaching and learning of statistics. While my students still have a long way to go in their learning, I think their performance is clear evidence that it is time for normal distribution tables to follow into extinction the tables for roots, logarithms, and trig values. As reported in Runner’s World magazine, the times of the finishers in the New York City 10K run are normally distributed with a mean of 61 minutes and a standard deviation of 9 minutes. … If my time was at the 70th percentile, how fast did I run? OK, it’s not a deep question at all, but I like what my student did with it. Given the area under the curve, my students should have invoked the TI-Nspire’s inverse normal command with the area, mean, and standard deviation for a quick solution. This image of K’s response is a quick example of what I expected. I was very surprised when I read T’s response. The first thing to note here is that T obviously made a mistake in his computations which led to his wrong answer–but his insight was grand. Rather than memorizing and using the two computer commands, T recognized that his CAS might let him get away with a single command. The heart of his syntax says normCdf(x, ,61,9)=0.7 which means there is some region bounded on the left by some unknown x and on the right by which has area 0.7. He came up with this alternative solution all on his own! Rather than memorizing “given area means use invNorm“, T clearly understood that this problem gave the area under a normal curve for some unknown boundary–arguably a deeper understanding of inverses than any memorized algorithm. He recognized the power of his CAS to solve equations that are otherwise algebraically complex or impossible. Particularly nice is his comfort with normCdf as a function and his use of that function in an equation that can be solved. I doubt T actually considered this point, but any CDF is automatically a 1:1 function, so an nSolve command can be safely used without worrying about missing potential multiple solutions. 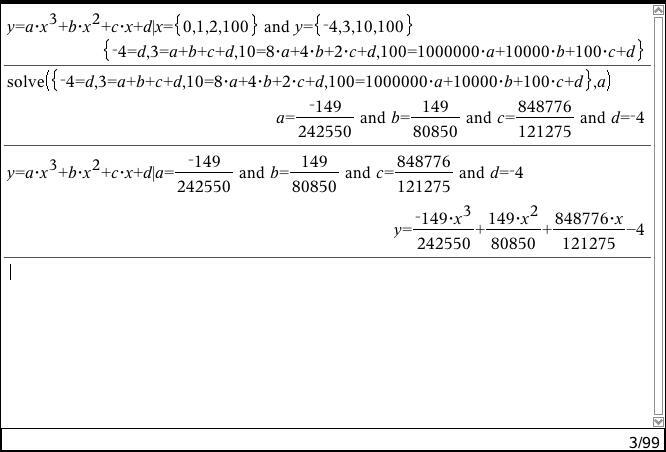 In the early 1990s when I was using TI-89s to teach a statistics course at a local community college, I routinely used a solve command on CDF commands with great success, so I naturally tried solve(normCdf(x, ,61,9)=0.7,x) on my Nspire prior to starting this unit. I was disappointed that my TI-89 capability from a decade earlier no longer worked, and I was too “trained” to consider nSolve (numeric solve) when solve had already failed. This is a major reason why I believe all teachers should encourage all of their students to be creative and to search for solutions that make sense to them. I’ll try to offer in a future post some more technical explorations I’ve done on this technique inspired by T’s approach. Here’s a question I posed to one of my precalculus classes for homework at the end of last week along with three solutions we developed. 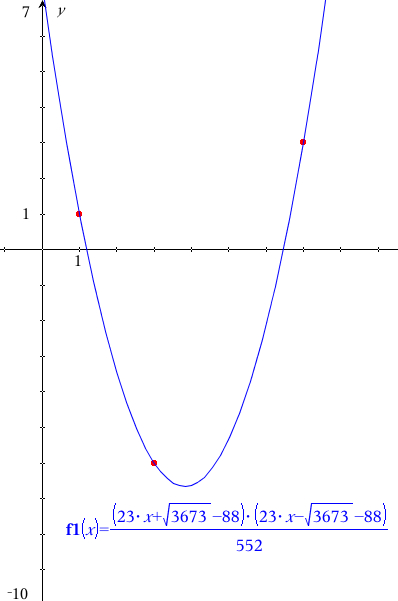 Suppose the graph of a cubic function has an inflection point at (1,3) and passes through (0,-4). give TWO different cubic equations that would pass through the three points. SOLUTION ALERT! Don’t read any further if you want to solve this problem for yourself. The first question relies on the fact that every cubic function has 180 degree rotational symmetry about its inflection point. This is equivalent to saying that the graph of a cubic function is its own image when the function’s graph is reflected through its inflection point. 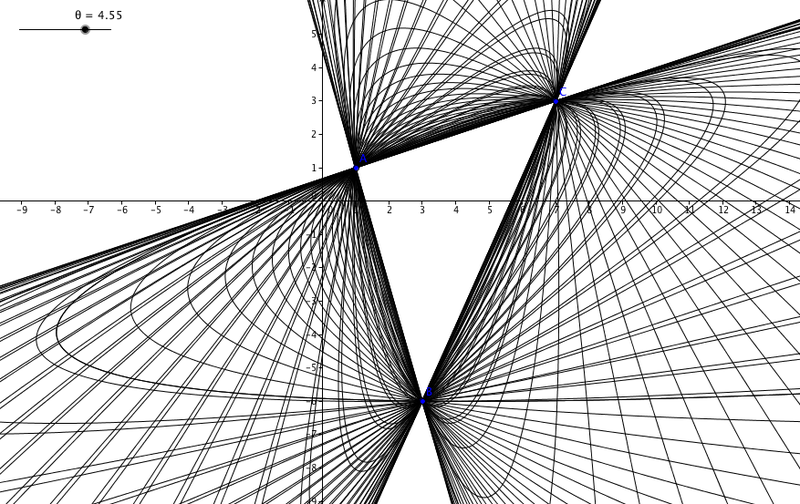 That means the third point is the image of (0,-4) when point-reflected through the inflection point (1,3), which is the point (2,10) as shown graphically below. From here, my students came up with 2 different solutions to the second question and upon prodding, we created a third. SOLUTION 1: Virtually every student assumed was the parent function of a cubic with unknown leading coefficient whose “center” (inflection point) had been slid to (1,3). 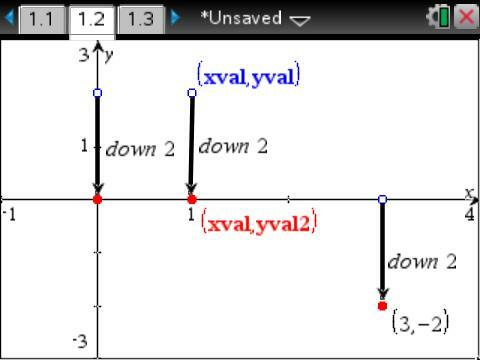 Plugging in the given (0,-4) to gives . Here’s their graph. SOLUTION 2: Many students had difficulty coming up with another equation. A few could sketch in other cubic graphs (curiously, all had positive lead coefficients) that contained the 3 points above, but didn’t know how to find equations. That’s when Sara pointed out that if the generic expanded form of a cubic was , then any 4 ordered pairs with unique x-coordinates should define a unique cubic. That is, if we picked any 4th point with x not 0, 1, or 2, then we should get an equation. That this would create a 4×4 system of equations didn’t bother her at all. She knew in theory how to solve such a thing, but she was thinking on a much higher plane. Her CAS technology expeditiously did the grunt work, allowing her brain to keep moving. A doubtful classmate called out, “OK. Make it go through (100,100).” Following is a CAS screen roughly duplicating Sara’s approach and a graph confirming the fit. The equation was onerous, but with a quick copy-paste, Sara had moved from idea to computation to ugly equation and graph in just a couple minutes. The doubter was convinced and the “wow”s from throughout the room conveyed the respect for the power of a properly wielded CAS. In particular, notice how the TI-Nspire CAS syntax in lines 1 and 3 keep the user’s focus on the type of equation being solved and eliminates the need to actually enter 4 separate equations. It doesn’t always work, but it’s a particularly lovely piece of scaffolding when it does. SOLUTION 3: One of my goals in Algebra II and Precalculus courses is to teach my students that they don’t need to always accept problems as stated. Sometimes they can change initial conditions to create a much cleaner work environment so long as they transform their “clean” solution back to the state of the initial conditions. In this case, I asked what would happen if they translated the inflection point using to the origin, making the other given point (-1,-7). Several immediately called the 3rd point to be (1,7) which “untranslating” — — confirmed to be the earlier finding. For cases where the cubic had another real root at , then symmetry immediately made another root, and a factored form of the equation becomes for some value of a. Plugging in (-1,-7) gives a in terms of r.
The last line slid the initially translated equation using to re-position the previous line according to the initial conditions. While unasked for, notice how the CAS performed some polynomial division on the right-side expression. 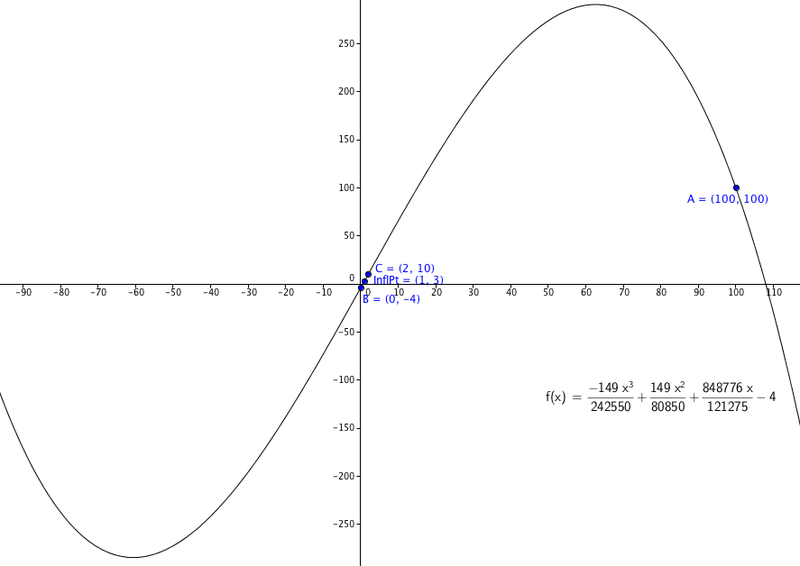 I created a GeoGebra document with a slider for the root using the equation from the last line of the CAS image above. The image below shows one possible position of the retranslated root. If you want to play with a live version of this, you will need a free copy of GeoGebra to run it, but the file is here. What’s nice here is how the problem became one of simple factors once the inflection point was translated to the origin. Notice also that the CAS version of the equation concludes with , the line containing the original three points. This is nice for two reasons. The numerator of the rational term is which zeros out the fraction at x=0, 1, or 2, putting the cubic exactly on the line at those points. The only r-values are in the denominator, so as , the rational term also becomes zero. Graphically, you can see this happen as the cubic “unrolls” onto as you drag . Essentially, this shows both graphically and algebraically that is the limiting degenerate curve the cubic function approaches as two of its transformed real roots grow without bound.